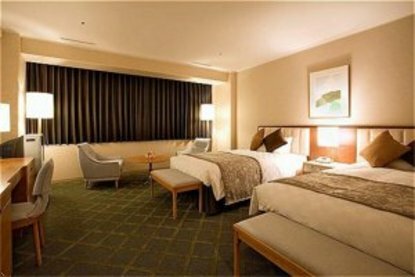 Grand Prince Hotel Kyoto is located in the surroundings with the beautiful Kyoto mountains features 309 spacious guest rooms with 37 square meters. Spectacular banquet halls and a variety of restaurants. A variety of authentic Sukiya-style tea house is located in the Japanese Gardens providing a flavor of traditional Kyoto. Hotel is also adjacent to the Kyoto International Center. Subway from Kyoto Station will take you to nearest station within 20 minutes and this hotel is only 3 minutes from the station. Free shuttle service may available on Sat. Sun. and Japanese National Holidays from Kyoto Station. The hotel features spacious guest rooms -44 sqm. Spectacular banquet halls and a variety of restaurants. A variety of authentic Sukiyo style tea houses are located in the Japanese Gardens providing a flavour of traditional Kyoto. The hotel is also adjacent to the Kyoto International Hall.